As the convention is edging closer and closer and we all can feel its breath down our necks (someone hasn't brushed their teeth all year!) here's a quick run-down / re-cap of.... things nearby! Let's do a quick run of places to go when you need to get that super important thingie you forgot on your kitchen table. Number 1 in our humble map is, of course, the Estrel itself in case you get lost. Number 2 is the local McDonald's. Mmmm, greasy! It's open until 02:00 on Friday and Saturday and until 01:00 at any other day of the week. McDonald's in Germany doesn't have any coupon specials this month, but currently you get a free glass with every menu purchase. Woop. Or something. Number 3 is the Neucölln Carree, which, yes, spells the name of the borough wrong. This is a middle-class supermarket with a sizeable drinks and beverages section. Also stocks alcohol. They also have a bakery. Open daily 7:00-21:00 except Sundays. If you've been to previous EFs, this is the former E Reichelt store that underwent a rebranding two years ago. Formerly hard discount food store, now still slightly discount-ish, but with some brand names. Chain drugstore, selling everything for beauty and hygiene and also some medicinal products like sticking plasters, contact lens fluid and so on. Goes beyond what Edeka and Aldi usually have in stock. Open daily 8:00-21:00 except Sundays. Pharmacy that carries both over-the-counter and prescription medicine. Open 8:30-19:00 Monday to Friday, 8:30-14:00 on Saturday. HINT: German pharmacies are required to be on a rolling system of standby services; that means outside of normal store opening hours you will always have a local pharmacy that is available for immediate needs. The Estrel concierge should have a list. HOWEVER, they do charge extra for the privilege of you getting your medication at 3 in the morning. To circumvent that, a little tip: The pharmacy in Berlin's main railway station is open 24/7/365 and there's the M41 bus from the Estrel that goes right there. If you want to avoid navigating unfamililar areas of Berlin after hours to find the little neighbourhood pharmacy that is open on this specific date, just try this option instead to get the job done. Number 4 , finally, is the local Netto (without dog). Note that this is a Netto City, and as such has a somewhat smaller selection than the other supermarkets, but still covers the most basic needs for food and drink, and yes, it also carries alcohol. Open daily 7:00-22:00 except, you guessed it, Sundays. 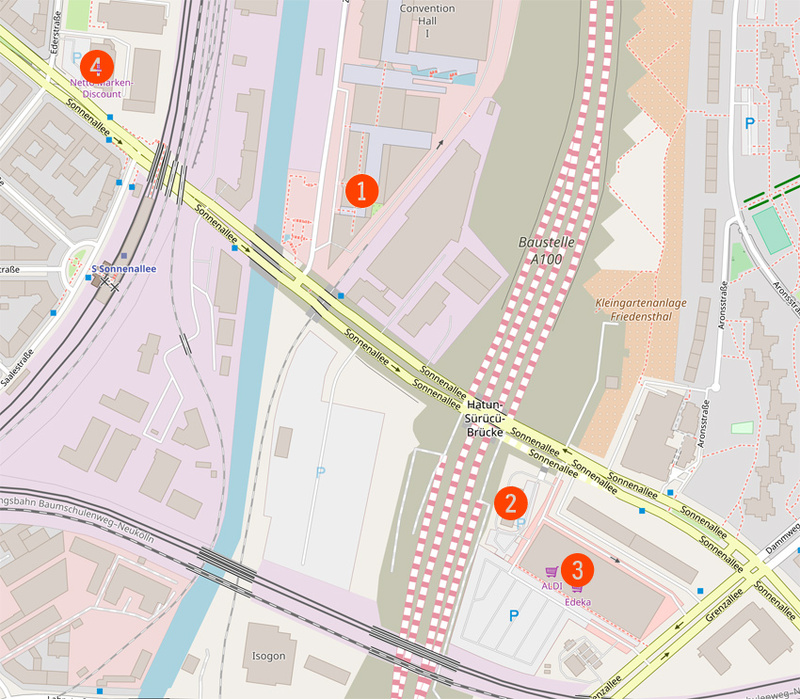 If you follow Sonnenallee further north-west (to the top left direction on the map) there is a "Lidl" after 150m on the left side (double the distance from estrel(1) to netto(4), then on the opposite street side). Consider Lidl being basically the same as Aldi, just a little different. Some prefer Lidl over Aldi. Edit: The next drugstore from the chain "dm" is rather far away, same for the supermarket chain "rewe". Unless you need anything that's only available there, better stick to the places mentioned above.